Tales of the Trees: How Much is that Doggie in the Window? I too love the goldendoodle...my favourite is the moodle aka as the multi-poo...probably because I am small. I would hate to carry around a LARGE dog when it got sick! I'd much rather bathe a small dog. However, a large dog would be fun to walk in the woods, when we go geocaching all the time!! I love goldendoodles too! 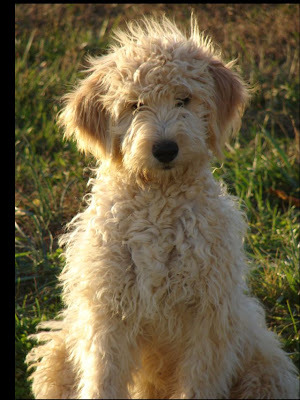 I would like to have a mini goldendoodle because I don't think I could handle a big dog! Are they not the cutest things? Just seeing pictures of them makes me fall in love with them! im in love with ALL dogs! xo. My friend and her mom both god goldendoodles in the past 2 years. They are cute dogs, sweet dogs. But man are they stupid. For some reason, they're just unintelligent. Sure, they're potty trained and can do tricks... but they are NOT the smartest dogs around. That being said, I think mutts are cuter than any type of bred dogs, but that's just my opinion. And no matter what, dogs are 5000 times better than cats. I hate cats! I'm a fan of big dogs, I'm always afraid I'll smush a little dog. I have a 4 month old australian shepherd that I think is the cutest thing ever, but that golden doodle does look like a teddy bear! We actually have two Cavalier King Charles Spaniels, but in general, I find myself amazed by larger dogs! Having said that, I wouldn't trade my Cavaliers for the world, they are the most fantastic breed! Last summer I was convinced Mr. H was finally going to buy me a pet for my bday in September. We talked all about kittens and how we could have one in our apartment for free and we would get one of those anti-smelling kittylitter boxes. Mr. H proposed in August and I was so surprised and happy and thankful that I forgot about our kitty. When my bday rolled around he told me straight up that he decided to get me a ring instead of a kitten so I wasn't going to get a new pet. I couldn't be sad b/c a ring is so much better than a kitty - but still!! I want a pet!! I am definitely a big dog person. Little dogs tend to drive me crazy. not all of 'em, but a lot of them. I wanted a bull terrier all through college. I was so determined to graduate and get one, and then one day a friend of my mom who volunteers in dog rescue groups brought a little lab/hound mutt to my house. She was malnourished and so tiny. My heart was sold to this little dog. Or mutt is now a 60lb crazy animal, but I couldn't love her more! I grew up with only cats- not dogs. Hubs grew up with only dogs- no cats. So we now have both- one dog and one cat. I really, REALLY wanted an English Bulldog but since they're around $1800- Hubs definitely said no. So we compromised on a yellow Lab from his childhood dog's litter. And I LOVE labs- they're SOOO loving and obedient. Get one! It's the best thing ever! Promise! I never grew up with animals, ym Mother flat out refused(I think she was scared of dogs... and my older sister got a cat when she was four and she used to pull it's tail when it was near me and the cat thought it was me so it bit me! My mom got rid of it ASAP!) Anyways because my Mom never allowed us to have animals I was scared of dogs! When I moved to "college" and lived on my own I got bored and lonely. So one day, a year after I moved in, I ventured out to get my first puppy! I was excited and thrilled. Until I found out that my landlord changed his rules and no longer allowed animals in our building! Well a year later I started dating my now boyfriend. I ALWAYS used to stay at his condo with him and his friends. One of his friends girlfriends had a yorkie and I adored her. I literally cuddled her day and night. So when my boyfriend and I decided to move in together... he bought me my very own puppy. 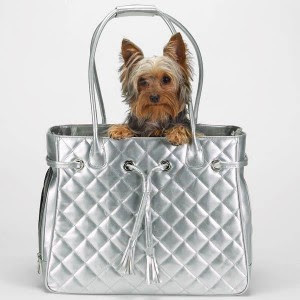 A little yorkie! :) I've had him for 8 months now and it has changed my life in more ways than I can imagine! SERIOUSLY! I love that little animal more than anything in the world... in fact, I've never loved something so deeply. My advice: get a pup! Goodendoodles are definitely the rage these days - I see millions of them at the dog park. I LOVE poodles. Everyone is mixing the poodle with every breed to try to get poodle hair and poodle temperament. I say, just get a poodle! (-: I have a standard poodle that is massive, and he is such a sweet dogs. Poodles rival the border collie for the number one spot in intelligence rankings and they are VERY human like - they love to be around people. Sometimes too smart for their own good. They are incredibly laid back. My dog lays on the floor a lot, but he also loves to play (they aren't hyper like a lot of breeds). Plus, they don't shed (BIG DEAL TO ME) and they don't drool (EW!) like lots of dogs do. They are very clean eaters/drinkers - they don't get it everywhere. So when I pet my dogs I don't have to worry about getting huge amount of saliva all over me. That's really nice. And also, poodles originated as hunting dogs - water retrievers - Poodle comes from the german word pudel - to splash around in the water. Hmm... maybe I should make a blog about poodles. I think I will. Thanks for the idea! Anyway, that was a novel... sorry. I just love poodles! And now that I've had them I don't think I could ever get a different kind. That dog is too cute!! And I'm a big and little dog person...I love both big and little dogs! :) They are the best! i'll take your massage gift card if you don't want it!!!! :) i'm obsessed with them! I LOVE all the pictures of goldendoodles I've seen and they sound like great dogs! All the best qualities from goldens and poodles. BUT I have a really soft heart for animals in need and probably wouldn't feel right paying for a bred dog when there are TONS in shelters that need homes. We have three rescue pets and will probably always go that way when picking out any future pets. Definitely a big dog for me! However, I would suggest that if you have a big dog just know that they will have TONS of energy with not as much room to play! We love our yellow lab, Bogey--he's definitely filling the child role in our family quite well! I want a dog so bad too!! I want a big dog - golden retriever to be exact. That is the first thing we will buy when we have a house! Coming from a lab owner, lab=loads of energy so does poodle. Just so you know. Srsly, like crazy amounts of energy. Goldendoodles are so cute! I hope you get a dog and a house soon! I am a small dog person. Big dogs are...well, just too big for me. I don't liked to be knocked around by something that weighs almost as much as me and not to mention is probably as tall as me when they stand up on their hind legs. I like little dogs so I can push them around. haha! Just kidding! I am most definitely not a small dog person!! I grew up with a Sheltie, which isn't too big, but was the greatest dog! A Sheltie is like a miniature Collie- a little Lassie! I then got a Brittany Spaniel, which isn't huge, but a good size- my parents now keep her. And WEG and I have a 90 lb. chocolate lab that is still growing! I just don't like little dogs that yip a lot, and I definitely don't like cats! awww what a sweet/funny story! I have gotten my hopes up for something before that i thought drew was goign to do and it didnt happen.. you feel mad and wrong at the same time haha. You go get yourself that dog girl! Too Cute! I like big dogs- I like the protectiveness factor that would bring. I'm a fan of Newfies and St. Bernards- though my parents are talking about getting a puggle(pug/beagle mix) and they are just adorable! I hope you get your dog soon!!! So cute!! My brother has a labradoodle and he really is like a giant teddy bear. I can't wait til y'all can get a puppy! the PUP is adorable!! i hope you can get one! i am a small pup kinda gal, i love my little gussy :) he is the best, ever! sorry you didn't get your puppy that year!! You should MOST def get a goldendoodle! they are ADORABLE!!!! My friend Sarah has a black one! 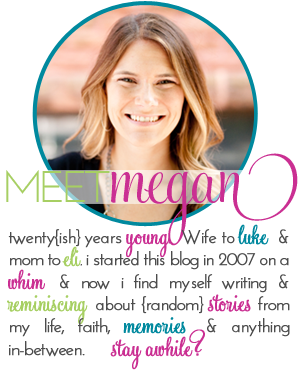 (the one I just posted on my blog!) he is SOO stinking cute and nice! I like all sizes of dogs. I have a Westie, but I saw the cutest lab the other day...he was HUGE, but he was so sweet! Get one of each! We have a little rat terrier/chihuahua mix and a shar pei/hound mix (both adopted). They love each other and of course the "little" one rules the roost! We have a Saint Bernard so needless to say we are big dog lovers!!!! Not a dog lover, but we have a cat named Mia. Love her, but she sheds horribly! Goldendoodles are awesome dogs! I am much more a fan of the big dog. Little dogs are too yappy for me! I hope you get your dog soon. They really bring so much to your life! Awww, the goldendoodle is so cute! Casey's childhood neighbors have a labradoodle and it's really sweet and cute.